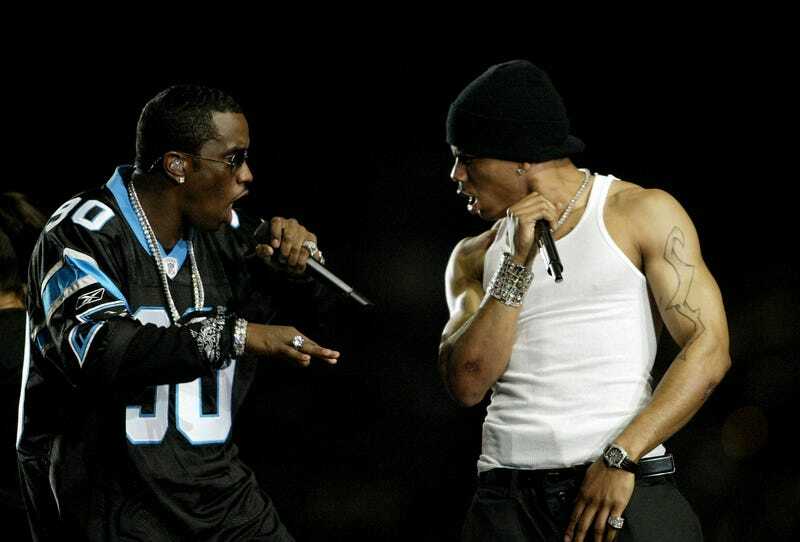 Sean “Puff Daddy” Combs and Nelly perform during the halftime show at Super Bowl XXXVIII between the New England Patriots and the Carolina Panthers at Reliant Stadium on Feb. 1, 2004, in Houston. The man making Cam Newton’s clothes must be setting the price for the Carolina Panthers because the embattled team owner now wants $2.5 billion, which would set a record for a U.S. professional sports franchise, and has pushed the major financial arm of Sean “Diddy” Combs and Steph Curry’s bid for minority ownership out of the running. Bloomberg is reporting that billionaire Michael Rubin, executive chairman of sports-apparel company Fanatics, watched the price escalate faster than the temperature in the room when Aubrey O’Day and Donald Trump Jr. first met and said he’s out. Rubin was to be the majority owner of the team, with Curry and Diddy owning smaller pieces of the franchise, although nothing was ever set in stone. Current Panthers owner Jerry Richardson listed the team for sale late last year after being accused of sexual and racial misconduct in the workplace. Richardson would reportedly have female workers turn around to show him their backsides on “wear jeans to work” day and allegedly used a racial slur to refer to an African-American team scout. Bloomberg notes that when Curry and Diddy expressed interest in owning the team, the price was set at $2.3 billion. After a reported bidding war, the price was driven up to $2.5 billion. Once a winning group is selected, 75 percent of the NFL owners must approve of the sale, which is how the NFL remains a rich white man’s league, considering that having enough money doesn’t guarantee that you’ll actually be able to purchase a team.